Jenny writes about motivation tips and techniques. Starting your own business is an exciting, but daunting prospect. Here are the top ten resources for online entrepreneurs to make that start-up a little bit easier. Image courtesy of Enterprise NationGetting your business out there is crucial. Joining online communities like Enterprise Nation for £20 per year will provide you will further support and guidance as well as social events and workshops to help your business flourish. Image courtesy of SavvySexySocialSmall businesses tend to have small budgets. Marketing is an area that is often overlooked but absolutely crucial to your businesses success. Fortunately, Amy Schimattauer at SavvySexySocial has created a series of smart marketing videos to help entrepreneurs get their heads around branding and how to make technology work for you. She vlogs three times a week and also has a website full of resources. Image courtesy of PicMonkeyDid you miss out on Photoshop classes at college? Don’t fret, PicMonkey is your new best friend. Design professional looking images, logos and pictures for your website and branding. There’s a great blog with handy hints about how to create killer branding and tips on taking photos too. Image courtesy of FreeagentSo you’ve got your designing and marketing sorted, but what about your accounts? If the thought of accounts, taxes and invoices scares you, get familiar with Freeagent. This website is a super easy way to manage your accounts. See what you owe in taxes and send directly to your accountant. You can also manage your estimates and invoices with their free invoice-o-matic tool. Image courtesy of Fast CompanyPrint this brilliant infographic and pin it up in your office. 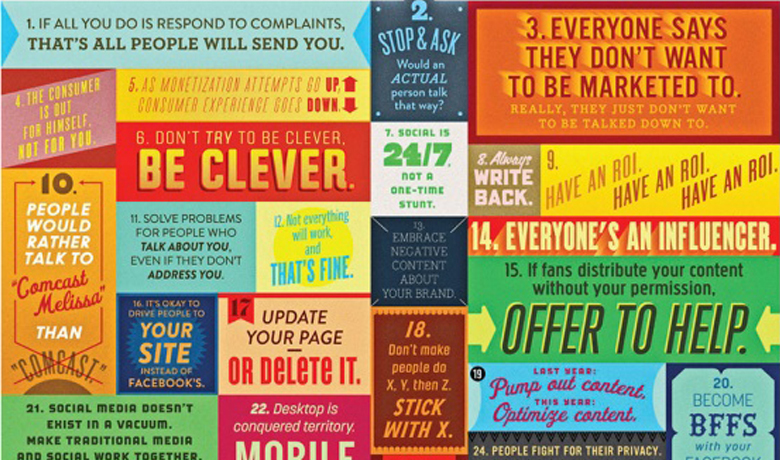 The 36 Rules of Social Media come from thirty-six experts from a diverse range of small and large businesses such as Microsoft, Whole Foods and Funny or Die. Image courtesy of DocusignEven remote workers need to get documents signed, but if your office is a coffee shop in Shoreditch and your client is sitting in Starbucks in Seattle, how can you get him to quickly and legally sign your contracts? Docusign lets you send and receive documents quickly and securely. You upload your document with drag and drop icons to tell your client where to sign. The best bit? It’s mobile friendly, so you can send and receive whilst on the move too. Image courtesy of Ivory ResearchCommunication is key to receiving and maintaining business. Make sure you pitch yourself properly by using a professional writing service to help craft your words. Ivory Research is the UK ‘s leading academic writing service and has quality writers ready to prepare your presentation or professionally produce your report. Image courtesy of David GoehringLike listening to music whilst you work? Unfortunately, it’s like to be the wrong kind. Popular music taps into the wrong part of your brain and actually distracts you. Make sure your mind remains focussed on the task with focus@will. This website has been developed in conjunction with neuroscientists to create music that helps you work more productively. Image courtesy of unsplash.comDo you get to 3pm only to panic and realise you haven’t even started on that big project yet? Find out how you’re spending your online time by using a tool such as Rescuetime. Rescuetime sits in the background and monitors how much time you spend on websites. You can download a report, or upgrade to the premium version and opt for voluntary banning from certain websites, if you don’t trust yourself! Running your own business means you’re probably running all over the place! General organisation is difficult, but tools like Evernote make it so much easier. Starting up a business is scary but these resources will make sure you get a head start in the game, from the first idea to helping it grow into whatever you want it to be. Hi, I’m Jenny Wescott! I am very passionate about self-betterment. I love to read write and share anything to do with motivation tips and techniques. My goal in life is to become an iconic figure in the world of motivation and in the process of becoming a motivation talker.